Hey, you spent good money for this stuff and you want to get a lot of use from it. And you can, IF you take good care of it. You don’t expect to buy a car and never have to change the oil and check the air in the tires. With a little care and TLC, your boating gear will perform better and last longer. Lots of boating gear has neoprene in it. Why neoprene? It has properties that make it a natural for boaters. It’s a closed cell foam “rubber” material. The “cells” are numerous pockets of gas, usually nitrogen, throughout the material. These gas pockets retard the passage of heat through the material, giving neoprene good insulating properties. The “closed” designation refers to the fact that the rubber keeps water from seeping in and filling the cells. Another good thing for boaters is that neoprene is quite buoyant, so it helps you stay afloat. Neoprene is formed in a chemical process. The two basic processes use either petroleum or calcium carbonate (limestone) as their raw materials. NRS has switched its neoprene source to one made in the calcium carbonate process; we call ours Terraprene™. While it still takes considerable energy to produce, we believe the raw material is more environmentally friendly. One thing that’s death on neoprene is chlorine. If you’re using HydroSkin, a heavier wetsuit, sprayskirt, etc in a swimming pool for roll practice or water aerobics, you’ll need to go the extra mile to prevent the rubber from disintegrating. Rinse with fresh water any items exposed to the high chlorine content of pool water, right away after you get out. 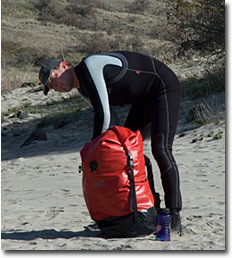 Wetsuit & Drysuit Shampoo has ingredients that neutralize chlorine and do a good job of cleaning the gear. Tears and holes in these items can be repaired with a couple of different products. Quick, field repairs are best done with Aquaseal+NEO Contact Cement, a contact adhesive. After cleaning and drying the tear area, apply the adhesive to both sides and allow to dry for five minutes. Then put on another layer of adhesive and let dry for about 10 minutes. Press the two sides together for at least 10 seconds, then you’re good to go. Aquaseal Flexible Repair Adhesive is another excellent repair aid for neoprene. Since Aquaseal is not a contact adhesive, it requires a slightly different technique. For a tear in the item, after cleaning and drying the tear area, bring the edges together and use a piece of tape on one side to hold them together. Then apply Aquaseal to the other side of the tear, working it down between the edges and about ¼” beyond the tear. Keep the repair area level and allow to cure overnight (10-14 hours). If you mix 1-part Cure Accelerator/Cleaner to 3-4 parts Aquaseal, you shorten the cure time to less than two hours. You can also apply Aquaseal on high wear areas of your gear; urethane is a very abrasion-resistant material. Thinning the Aquaseal with Cure Accelerator makes it easy to spread with a brush and shortens the cure time. It’s a good practice to rinse your neoprene after every use. The water you boat in is crawling with microbes, dissolved solids and contaminants. Rinsing it well and drying it thoroughly before storing will help prevent mildew, odor and other nasty consequences. But let’s face it, even with conscientious rinsing and drying, neoprene gear can get really funky, especially booties, socks and gloves. Washing with the Wetsuit & Drysuit Shampoo helps control the funk, but when odor is still bad, using either MiraZyme or Sink The Stink gear deodorizers will take care of the problem. Each of them have a proprietary blend of odor-eating microbes and enzymes that eliminate the odor causing substances, not just cover up the odor. Finally, 303 Protectant is a product that belongs in every boater’s gear care arsenal. It’s a long-lasting sunscreen that prevents UV damage. As boaters and outdoor people, our gear is out there getting pelted by the sun’s rays for long periods of time. Spray it on and wipe off any excess. It’s not greasy or oily and it repels soiling and staining. Please let us know if you have questions about any of this. Have a great boating season and Boat Safe!